Screening Systems International does not just mass produce Water Intake Products. 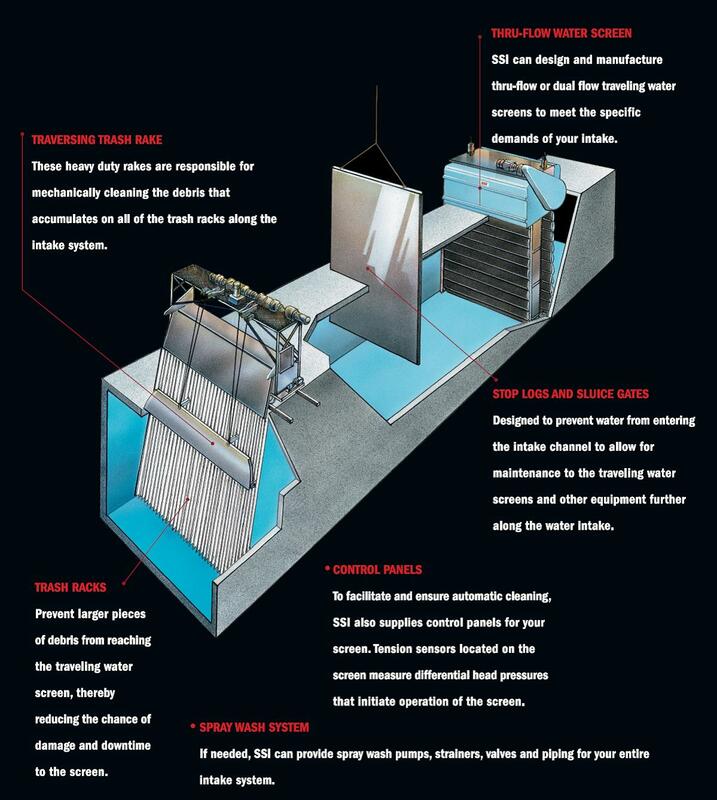 We can custom design all traveling water screens and parts, and rebuild exact replicas of an existing screen. We pride ourselves on catering to our customers' needs. More often than not, screens are designed to fit an existing intake system. When this happens each screen can need to be slightly different than the one before it. Needing a variety of screens can make it more difficult; a variety of GA drawings and parts may differ. SSI makes it easy! Once you've placed an order for a new screen we keep your water intake screen in our system. And because SSI will keep track of your screen you won't have to. When the time comes for a rebuild, parts or a new screen, SSI customers just call into the office and we pull up their file! Screening Systems International can manufacture any products you may need for your intake system. SSI is able to stay on the breaking edge of intake system manufacturing and design thanks to our dedicated design, manufacturing, sales, and management teams. In addition to these SSI Fish Handling Traveling Water Screens, we have been active in manufacturing trash rakes for the larger debris that can block a plant's intake system all together. Our most recent Monorail Overhead Trash Rake was tested and able to life 2,000 pounds of debris, all which moving with ease and turning corners. This automated trash rake will increase efficiency and lower cost, in comparison to manual raking. Some other intake products that SSI specializes in are our bar racks, bar screens, and stop logs. All of which are important aspects to any plant with a water intake system.